The First Hippo on the Moon is heading to the Churchill Theatre in Bromley this week 2nd-6th May as part of a tour of over 40 UK venues in 2017. The First Hippo on the Moon is based on David Walliams’ picture book and has been brought to the stage by innovative children’s theatre company Les Petits Theatre Company. The First Hippo on the Moon has been adapted for the stage by Les Enfants Terribles and Les Petits’ Artistic Director Oliver Lansley whose other adaptations of children’s literature have included the immersive dining experience Dinner at the Twits and Alice’s Adventure’s Underground. The puppets for The First Hippo on the Moon have been created by Nick Barnes and Finn Caldwell who have previously collaborated on War Horse and The Lorax. The cast for The First Hippo on the Moon includes Dominic Allen, Alice Bounce, Caroline Bowman, Owen Jenkins and Rosie Nicholls. quickly developed a reputation as a natural successor to Roald Dahl. His books have been translated into over 45 languages and sold over 9.5 million copies in the UK alone. The First Hippo on the Moon has been adapted for the stage by acclaimed theatre company Les Petits following their hugely successful production of Captain Flinn and the Pirate Dinosaurs. The creative team at Les Petits have also worked on Dr. Seuss’ The Lorax at The Old Vic and the National Theatre’s productions of Elephantom, War Horse and Raymond Briggs’ The Bear. Les Petits was set up as the sister company to Les Enfants Terribles whose work includes Dinner at the Twits, The Game’s Afoot, The Trench, The Vaudevillains and Olivier nominated Alice’s Adventures Underground. 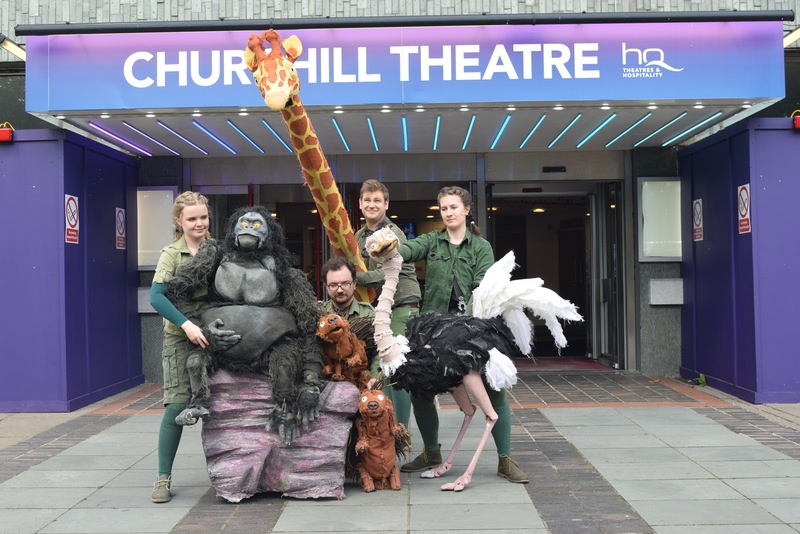 I can't wait to visit the Churchill this week to see The First Hippo on the Moon with Blake (age 7) and Maegan (Age 5) and I'm impressed with the selection of performances including ones after school and relaxed day time ones too. Look out for an update to this article later this week! Blake and Maegan had an absolute blast at The First Hippo on the Moon there was a lot of giggling! As a parent, there was way too much poo and bum talk in the show (look out for the song about poo and the audience poo contributions!) but that is what makes children laugh the most and entertaining them is why we went. The puppets are great and the actors seamlessly morph between puppeteers and characters. We loved a 5pm show on a weekday and would like to see this happen more often. Overall verdict? Both children would love to see the show again and we would recommend to a friend ... infact we already have - we have some friends (and readers) watching on Saturday! Thank you so much for telling us about this show - we had an amazing time today with the 3 sprogs - spot on! Also agree with the idea of 5pm weekday shows for kids but the ticket price for kids theatre has got to come down a bit - with tickets, booking fees and sharing popcorn we had to allow £100 for our family of 5 for an hour long kids show - ouch!